A New Port Richey landmark that offers a full Italian menu, hand tossed New York style pizza, a gluten-free menu and a growing selection of craft beers. 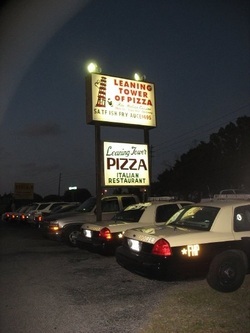 Opened by Carl Serpe in 1977, Leaning Tower of Pizza is the oldest restaurant in Pasco County and a central hub of the community. Want to be in the loop on local happenings? Stop in for lunch at the Tower. A favorite spot for local law enforcement, fire and rescue as well as politicians, business owners, Tampa Bay area athletes, and area cultural organizations, Leaning Tower is definitely a business that is all about building community. We sponsor many local events and donate to numerous schools, organizations and charities because we understand the importance of giving back. We’re open 7 days a week with the exception of Easter, Christmas Day and Thanksgiving Day. Come on in and hang with us, you’ll be part of the family in no time. With take out, delivery, dine in and a private room for large groups or meetings, we’ve got all your needs covered. 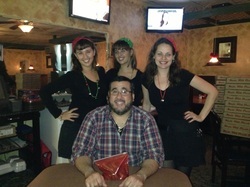 We also have the best Cuban Sandwich in the area!